Manchester City director Dennis Tueart has confirmed the club will retire the number 23 shirt as a mark of respect to midfielder Marc-Vivien Foe. The Cameroon international died after collapsing on the pitch during a Confederations Cup semi-final with Colombia. 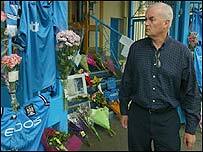 City fans paid personal tributes at Maine Road on Friday and the possibility of a tribute game between City and West Ham, Foe's two former clubs in England, has been mooted in a addition to the steps already taken. "We have laid a wreath in honour of Marc at Maine Road and we're retiring his number 23 shirt," said former City player Tueart. He added: "Marc came in and did a terrific job for us as a player and was an ambassador for his country. "He was greatly revered in Cameroon and did a fantastic job for us here." City boss Kevin Keegan added hiw own tribute to the player, saying: "Marc was not only a special footballer but a very special person. "We will all miss his smile and his personality. "Nothing was ever too much trouble for him and he was the ultimate professional loved by everyone in the dressing room and the boardroom." "It was a privilege to work with him for the past year and we were still in the process of trying to negotiate a deal that would have made him a City player."